When you connect two or more computer systems to a local network you need to make sure to assign unique local IP addresses to all computer systems to avoid conflicts. Conflicts may happen for a number of reasons, from assigning the same IP address manually to DHCP server issues. Conflicts may cause connectivity and functionality issues on affected computer systems. It can furthermore be difficulty sometimes to get to the root of the problem, especially if the issue is caused by software and not the user or system administrator. 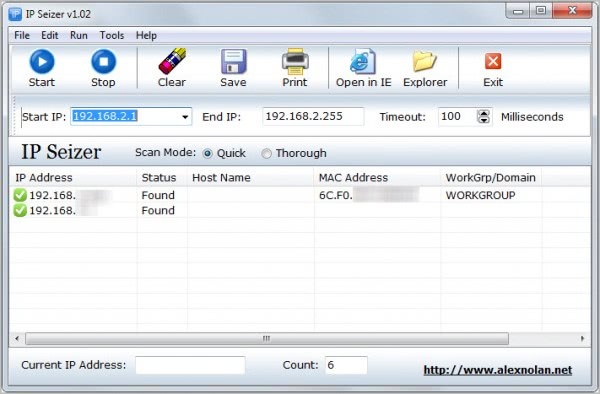 The free Windows software IP Seizer aids users by displaying IP address and related information about each computer system and device connected to the local computer network. The portable software can scan local IP ranges for connected devices. Each device found is listed with its IP address, host name, MAC address and Workgroup or domain. You can enter a start and end IP manually into the program, or use the suggested values for the scan. A click on start checks all IP addresses in the range for connected devices and adds all devices found to the list. Timeouts are set to 100 milliseconds which means that the program checks roughly 10 IP addresses per second. You can reduce the timeout to speed up the the time it takes to check the selected IP range. The thorough scan mode takes longer to complete but will provide additional information about each device found. This includes the device host name which is not retrieved during quick scans. The data can be saved as a text document on the local computer, or printed on a connected printer. The Tools menu at the top lists programs to ping a selected IP address and to display all IP addresses found in a small window. The ping command can be useful to check the response of a selected local IP address. IP Seizer is a useful tool to quickly check for local IP addresses assigned to devices connected to a network. It’s portable nature makes it a handy tool for a troubleshooting DVD or USB stick. The program is compatible with all recent 32-bit and 64-bit editions of the Microsoft Windows operating system. The latest version can be downloaded from the developer’s website. This entry was posted on Tuesday, January 3rd, 2012 at 10:29 am	and is filed under software evaluation. You can follow any responses to this entry through the RSS 2.0 feed. Both comments and pings are currently closed.